Xiaomi at CES 2017 unveils a new Mi Router HD but this device will only be available in China. 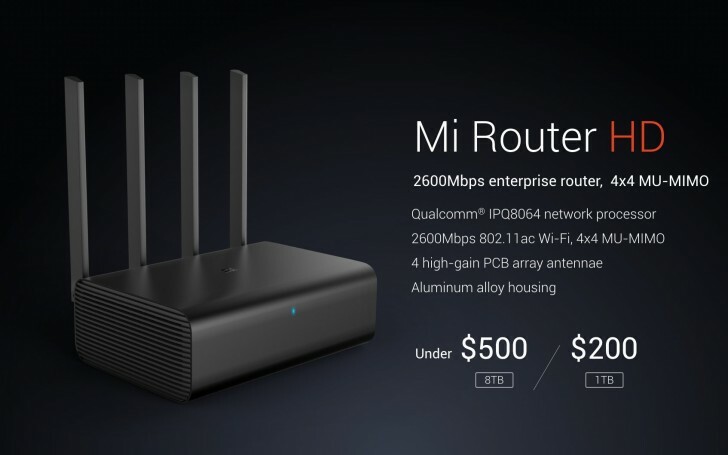 The Mi Router HD is a 2600Mbps enterprise router with 4×4 MU-MIMO functionality, four high-gain PCB array antennae, and Qualcomm IPQ8064 network processor. For backing up data from your device company has embedded a surveillance quality hard drive which will sync with your Dropbox account. You can either go for 1TB OR 8TB version. All of this is housed in an aluminum alloy body. The router will be up for grabs sometime in Q1 of the year and will cost $200 for the 1TB version and under $500 for the 8TB version.